The Jonas of Sweden food peeler is an excellent way to peel your fruits and vegetables. Not only does it do a great job of peeling your carrots and potatoes but also features a blade and ergonomically rounded handle constructed of stainless steel. A Jonas Original with almost 60 years tradition. This peeler was introduced in 1953 and has sold 100 millions pieces in over 40 countries around the world. The peeler has been named “Best in test” several times by Swedish consumer magazines. It is only the manufacturing process, which has changed during the years, the design has always been the same. The blade is produced of stainless steel and precision ground. The peeler is easy to use with right or left hand. All peelers have been manually inspected, which explains the excellent quality. 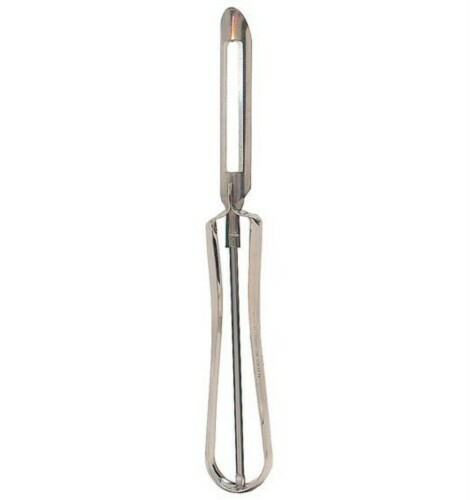 The peeler measures 6.5" long with the blade measuring 2.75". The "Prep it Up!" utensil Line by Jonas of Sweden is available in an entire range of utensils.